Announcement Boho jewelry / Bohemian Jewelry handcrafted with semi-precious stones and raw or antiqued copper and silver. 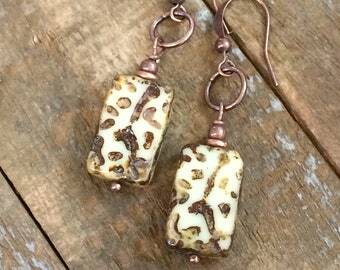 Please browse my full line of rustic, earthy turquoise earrings, turquoise necklaces, and other natural stone jewelry crafted with copper and silver. 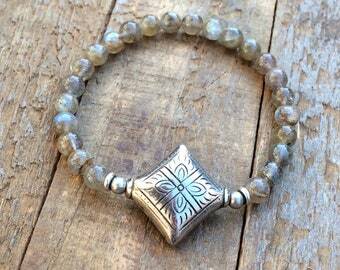 Boho jewelry / Bohemian Jewelry handcrafted with semi-precious stones and raw or antiqued copper and silver. 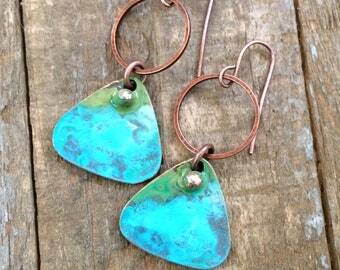 Please browse my full line of rustic, earthy turquoise earrings, turquoise necklaces, and other natural stone jewelry crafted with copper and silver. Looks much better in photo. Size & color more attractive. 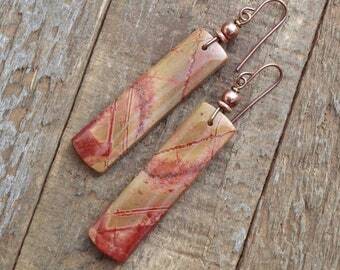 The warm color of the Jasper and copper is beautiful. The length is perfect and the craftsmanship was so well executed. This is my new favorite shop! 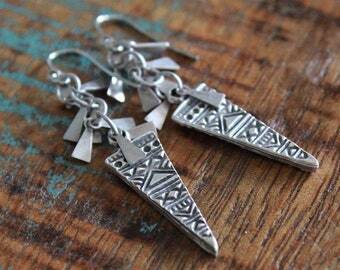 These earrings will go perfectly with the bar necklace I purchased from this shop. 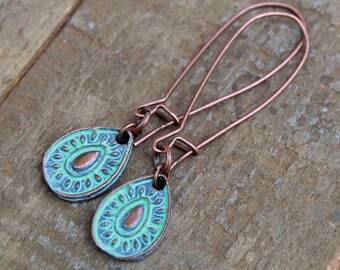 Love the coloring of the turquoise especially with the copper. Can’t wait to show them off at work. I love the bar style necklaces. 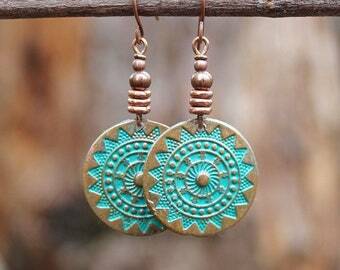 The copper and Turquoise combination is one of my favorites. This piece is one of my new favorites. 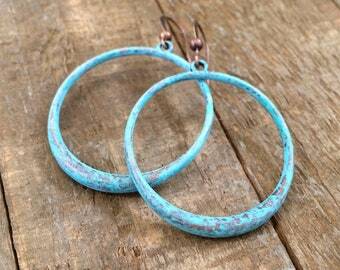 I have been purchasing a lot of copper and turquoise pieces lately and I am so pleased with these earrings. Great color and length. Excellent craftsmanship! Beautiful piece. 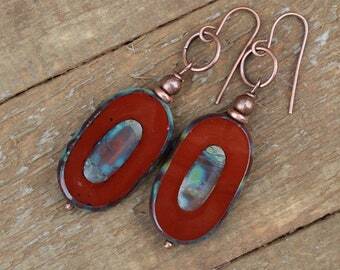 I love the warm tones of the Jasper and copper. Excellent craftsmanship, thank you! 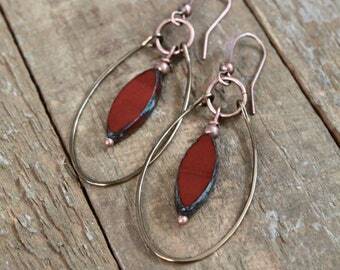 Absolutely love the colors in the stone beads with the copper. These earrings will go perfect with much of my wardrobe. Thanks! Blue jasper in a beautiful golden brown matrix. The metal studio where I cut metals, solder, forge copper and silver and do glass enameling. Hello, and thanks so much for visiting Rustica Jewelry! 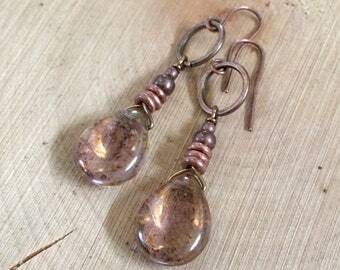 I'm Linda Blume, the owner, artist, designer, and maker of Rustica! I began making jewelry in 2009 while still a full time scientist. I have a BSc and MSc in biology and chemistry and worked in the pharmaceutical and research field for about 10 years. In 2008, I took a job with the marine fisheries service which landed me in New Jersey, and coming from Colorado that was a huge change! Not knowing many people, and being a crafty person, I knew I needed to pick up a new hobby or project to occupy my time. Since I love hands-on creating, I decided to make myself some earrings as I was always searching for perfect pair with no luck. How hard could it be, right? Well, after buying some beads, wire and a few tools, I got busy and was hooked! Over the next several years I took a few classes, read tons of books, watched a lot of YouTube and taught my self more advanced metalworking techniques. As my collection of jewelry grew, I started attending small craft shows to sell my new creations. I remember my first show making a profit of $35! In 2010 I joined Etsy and have been on here since. As my business grew it became more of a struggle to balance a full-time job and a side business. Fortunately in 2015 I was able to "quit my day job" and run Rustica full time! Currently I am coming up on my first full year of running my business and couldn't be happier! It is hard work, a bit stressful and times and long days but totally worth it. Along this journey I have learned so much about business, creating, selling, marketing, but more importantly I have learned self confidence, independence, and realizing what is truly important in my life. I have created a business which is continuing to grow year after year, and have created a way of life in which I can determine my happiness and freedom. It is truly wonderful for me to design my day and work according to what benefits my productivity rather than conforming to someone else's "work day". I have also met so many wonderful people that have been so encouraging and helpful! I feel so fortunate to have build a relationship with so many amazing clients that have been so supportive over the years! I cannot say thank you enough to these people that have helped make my dream a reality! I want you to be 100% satisfied with your purchase! If for any reason you are not, please contact me within 14 days of receiving your item for a full refund or exchange. 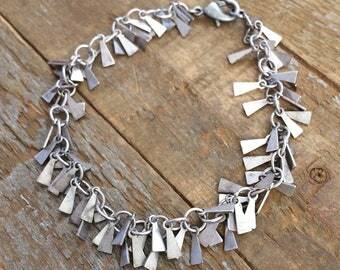 I offer lifetime size adjustments and repairs for any item purchased at Rustica Jewelry. Please note, I do NOT accept returns on custom ordered items. I will accept an exchange on these items depending on the discrepancy. - Orders generally ship within 3-5 days of purchase, depending on the quantity of items ordered and the time of year. Please be advised that during high volume holidays, such as Christmas, shipping may be delayed 1-2 days. - I ship all orders by USPS first class with tracking included, but priority or other rush shippings may be requested for an additional charge. - All domestic orders will be provided a tracking number. Please note that tracking information may not show up in the USPS system for up to 24 hours, and possibly longer during high volume shipping times. - I do ship internationally as well, though tracking information is not available unless a priority shipping method is arranged. - INTERNATIONAL ORDERS, please be advised that I complete all customs forms and pay all duties on my end. I am NOT responsible for VAT or other additional fees collected/required by your country's customs clearance. Please contact your local customs office to inquire whether an additional fee will be charged prior to ordering.